The No. 9 ranked Southwest DeKalb Panthers and Arabia Mountain Rams set up a big clash for the top of the Region 5-5A standings with wins last Friday night. Southwest DeKalb (8-0, 3-0) shutout the Lithonia Bulldogs (5-3, 2-1) 9-0 behind a suffocating defense that allowed the Bulldogs just 46 yards of total offense. The Panthers took a 3-0 lead into the half in the defensive struggle as Reano Ramjig hit a 26-yard field goal with 11 minutes to play in the half. Jamel Starks’ touchdown run with five minutes left in the third quarter made it 9-0. Eian Scott rushed 15 times for 82 yards to lead Southwest DeKalb. The win coupled with Arabia Mountain’s (5-3, 3-0) 38-6 victory over the Chamblee Bulldogs (0-8, 0-3) sets up the showdown for the top spot in Region 5-5A at 7:30 pm on Friday at Hallford Stadium. The Rams got a pair of Bryson Williams to Glenn Hayes touchdown passes (25 yards and 30 yards) to aid the two-time defending Region 5-5A champs to the win. Jordan Barrow added a 64-yard punt return for a touchdown and Jordan Grier struck for a 16-yard touchdown run for the Rams who remained tied with the Panthers in the region standings. In other Region 5-5A play, the Miller Grove Wolverines (2-6, 1-2) took a big step towards a playoff berth with a 14-12 win over Columbia (1-7, 0-3) at Hallford Stadium. The Class 3A No. 2 ranked Cedar Grove Saints scored 27 points in the second half to roll past No. 10 Pace Academy on the road on Friday. A 71-yard interception return by Jadon Haselwood and a 35-yard touchdown run by Robert Jones sent the Saints (8-1, 5-0) into the half. Pace closed the gap to 13-10 with a fumble recovery in the end zone for a touchdown in the third quarter. Cedar Grove answered quickly with Austin Smith finding a streaking Rashad Jordan down the left sideline for a 72-yard touchdown pass to extend the lead to 20-10. Montre Montfort’s fumble return inside the Pace five-yard line set up an Austin Smith touchdown run as the lead went to increase the lead to 27-10 as the Saints began to pull away. Jordan finished with four receptions for 119 yards and three touchdowns for the Saints who picked up the program’s 307th win. Cedar Grove hit the 300-win mark (307-196-6) in its season opening win over South Carolina Class 5A school Summerville. Summerville has gone 6-1 since that 21-7 loss and is tied for the lead in its region. The win clinched the Saints second consecutive Region 5-5A title. In other Region 5-3A action, the Stone Mountain Pirates (2-6, 2-2) picked up its second consecutive win of the season and in region action with a 35-8 win over the Towers Titans (0-8, 0-4) on Friday night at Godfrey Stadium. Redan (0-8, 0-4) dropped a 46-0 region game to Westminster. The No. 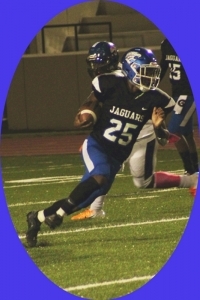 8 ranked Stephenson Jaguars (7-1, 6-0) scored seven rushing touchdowns on the way to a 49-14 rout of the Drew Titans in Region 4-6A action at Southern Crescent Stadium in Clayton County on Friday. Drew jumped out to a 7-0 lead by returning the opening kickoff before Stephenson would answer with 42 consecutive points. Ryan Ingram knotted the game at 7-7 with an eight-yard touchdown run. Donovan Moorer added touchdown runs of 12 and 40 yards in the game. 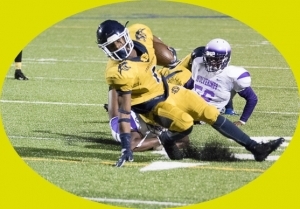 Stephenson finishes the season with two big Region 4-6A contests against second place Lovejoy (5-3, 5-1) this coming Friday (Oct. 26) at Avondale and then with their current co-leader Tucker on Friday (Nov. 2) at Hallford Stadium. The No. 3 ranked Tucker Tigers (6-2, 6-0) fell behind 12-3 to the Martin Luther King Lions (1-7, 1-5) before rallying to a 30-20 win in another Region 4-6A game at Adams Stadium on Friday. An 11-yard touchdown pass from Travon Ford to Torezz Alexander closed the gap to 12-10 and jump started the Tigers’ rally. 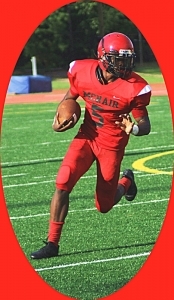 McNair fell to 0-5 in Region 6-2A as the Mustangs could not hold a 25-20 fourth quarter lead against B.E.S.T. Academy in a 36-25 loss at Godfrey Stadium. Andre Harris had 11 carries for 133 yards and three touchdowns and Kemra Matthew returned an interception 40 yards for a touchdown in the game for McNair, but it was not enough as B.E.S.T scored two late touchdowns to rally for the win. Dunwoody also got some big offensive production only to lose a Region 7-6A contest 47-32 to North Atlanta (4-4) at Grady Stadium. 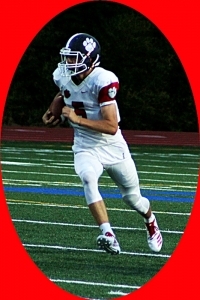 Quarterback Davis Ledoyen was 21 of 32 passing for 268 yards and four touchdowns to lead the Wildcat offense. Jack Hogan had two of the touchdown receptions on seven catches for 117 yards and also added a rushing touchdown. Luke Pankey caught six passes from Ledoyen for 59 yards and a touchdown. Robby Hardin rushed 23 times for 113 yards and had five receptions for 80 yards and a touchdown.